Have you heard of Pioneer Woman? She is an amazing woman who lives on a cattle ranch in Oklahoma. She has 4 kids, she home schools, maintains a blog and website daily, photographs every day and somehow managed to write a cookbook in her 3 minutes of spare time. And, oh, Pioneer Woman Cooks has reached #1 on the NY Times Best Seller list. Anyway, Bagette April, Bagette Karen, and I read her blog. She was in Nashville tonight signing cookbooks. Bagette April dearly wanted to go but her husband had to have surgery today. So, Karen and I went and got a book signed for her. . .
We gave out bags while we stood in line. . .
We saw a woman in line with a Green Bag Lady bag! She got it at the Farmers Market! Her bag is on the right and she was kind enough to hold the bag that we gave to Pioneer Woman on the left. . .
We finally got to the front of the line and gave Pioneer Woman (Ree Drummond) a bag. . . I told her about Green Bag Lady. . .
We also gave bags to Pioneer Woman's sister Betsy and her friend Hyacinth. . . FREEBIE!!!! Read on. . . If you made it to the end of this post, there is a reward, I will give away 2 Green Bag Lady bags that are made from Amy Butler fabric like the one we gave Pioneer Woman if you leave a comment on this post. •DEADLINE FOR THIS FREEBIE IS MIDNIGHT (CST) DECEMBER 12, 2009. Good Luck, I will randomly choose winners on Sunday. comments are closed, winners are: Carin and Orlita CONGRATULATIONS! Glad to see you got to meet Ree! Her dad did the surgery on our son's broken leg (separated fracture of the tibia) many years ago. A wonderful family! I think it's fabulous what you do! I love reusable bags. The christmas gifts we give this year will be "wrapped" in a homemade grocery tote. Thanks for all you do! Oh you are so lucky to have met pioneer woman. Even in Australia I have heard of her. I would love to have an amy butler fabric bag, to pass on to my aunty. How wonderful you got to meet Ree! She was not on tour near us or we would have been there! I would love one of your bags. Right now I only have one reusable bag so one more would help out when bringing home groceries! Thank you guys so much for everything you do! I SO wanted to go to the book signing tonight. Sadly, a family member needed my car! Your bags are lovely! What a wonderful idea and the bags are beautiful.Wishing you a Happy Christmas and a Peaceful New Year. I read about your great initiative in Sew Mama Sew! I can say I am proud member of your team! It's years that I only use fabric bags for my shopping (I mean all kind of shopping, clothes, supermarket, shoes... you name it) and I also give fabric bags as presents to my friend and family whenever I have funny fabrics. BTW I have just up-cycled 3 old summer dresses in bags and pouches. That's why I'd love one of yours!!! Btw, do you ship in Italy? PS sorry for loooong comment! It is great to see another freebie offer come up so soon! What fun...I also love reading PW and would LOVE one of your bags! One can really never have too many bags, right. This really is a great thing you are doing! I also heard about pioneer woman and I'm in Europe!Thanks for another give away, please count me in! did you say amy butler??!! Wish I could have been there to meet her, too! I had to scrap plans and stay home with a sick baby. How cool! I'd love one of your bags. My mom asked me to make her some reusable bags for Christmas. i love your initiative! i've been telling everyone i know about it, including my 12 yr old, who has been digging through her stash to join in! I'd love to win one of your fabulous bags! I saw this on Sew Mama Sew; this is such a great idea! I've been using cloth bags for a while now and have tried making my own too. I've converted some friends and family as well. Would love a bag, fingers crossed! Must be a part of your movement! Thanks for this chance! I would love one of your bags! Ladies! I think I was in line just a few people in front of you... I was there to get my sister a book for Christmas. She is an blogger and reads PW everyday. I must say that it was a great experience even for a guy that knows nothing about blogs. If I happen to win the bag, I will put my sisters book in it as an additional gift for the holidays. She lives in Taylorsville, NC so not sure if you have bags there. Check out her blog, lifeontheedgeofthedevilstrack(dot)com. Wow looks like you have tons of fun. I can be reached at x2boyznmom(at)aol(dot)com. Thank you, for all that you do. My children thank you too, for helping to save their planet! Hi! I heard about you from the Sew Mama Sew giveaway day. I live in Holland where you have to bring your own bags to the grocery store... which is great... though it definitely took a little getting used to after living in Canada / the US! I think what you're doing is great! Wow this is great. Just found your site from the Sew mama Sew blog. I am going to make some bags myself! But one of your bags would be awesome. Hello. You are such a wonderfully green inspiration! i would dearly love one of your bags! Hello - found your site through sewmamsew. I am an expat living in Moscow Russia. Grocery stores here have been charging for plastic bags for a while - everyone pretty much carries around old plastic bags to reuse. I saw the other day one store had some reusable bags for sale, fabric bags would be great! That is so fun that you got to meet Ree! Thanks for the chance to win one of your bags! Love your bags and love the Pioneer Woman. I ask for and give bags for presents. They make such great gifts! I love PW! I'm so happy I read about your bags on Sew Mama Sew today too. My SIL's birthday party is tonight and she wants people to bring canned goods to donate. Now I'm going to whip up a green bag lady bag to put them in! I made it here through Sew Mama and love Ree and I love Amy Butler fabrics. I'm going to try making some bags as soon as I get my machine fixed and some lovely fabric to make them from, but maybe I'll win one, too! Hi. Just found you. Would love to be a part of your "commercial" here in Indianapolis. So beautiful in every way. Wow, that's awesome. Love Ree's blog and recipes; how awesome that you got to meet her! Thank you for this great give away! i'm giving a reusable bag to everyone this year for Christmas. I didn't know what to get the last few people on my Christmas list and I stumbled over here from Sew Mama Sew. I think I found just what I have been looking for! I love the PW blog, too. You're so lucky you got to meet her. Wow, a bag made of Amy Butler fabric would be super. I think what you are doing is so great!! I use cloth bags for groceries, but not yet for other purchases -- a few cute bags like these would be just the right impetus. :) After Christmas sewing is done I'm also going to make a bunch for myself and my family. Thanks for the inspiration! I love the idea of reusable bags. Go Green! Your blog is very inspiring! I am ready to make bags for those on my holiday giving list. That is awesome that you met Ree and that you gave her one of your great bags! Still reading about you on SMS too, definitely have some of your bags to make in my future. good way to protect mother earth. i love it with a such an inspration. may be we can promote it all over the world. I have enjoyed making totes this year for Christmas along with drawstring bags for gifts. No Christmas paper purchases for me!!! I have enjoyed several recipes from the Pioneer Woman's blog. What a great idea! I think I'll be making some fabric bags as presents this year. hi! I would appreciate one of your beautiful bags so much!And i think it's fabulous that you got to meet Ree lol. I don't know if you would ship to oregon but i'll give it a shot right? Your bags are beautiful! What a great change you are making. Wow, I think what you do is fantastic! Congratulations on the difference you are making in this world, you must be so proud. I am gifting grocery bags for christmas presents this year, I am making mine using Oilcloth. Thanks for the opportunity I love Amy Butler! How exciting, I would love to meet Ree! I honour your efforts here with your reusable bags. Wow! I found you through the Sew Mama Sew blog. I'm new to sewing and I'm eager to try your tutorial to make my own bags. Thanks for the chance to win one of your bags! This is my first visit to your site. Great idea! We have purchased cloth bags that we use and I keep planning on sewing my own with fab fabric, but somehow children and other sewing projects have postponed my bag sewing. I'd love a chance to win some wonderful fabric bags. Your bags are so adorable! I would love to have one and reduce the plastic in our lives. This is such a fun way to share your passion! I'm looking forward to getting more involved. Would love to receive one of your bags! :) I'm starting to sew my own, too. So fun! What a neat idea. I have lots of fabric from clothes my kids have outgrown that I've saved. This would be a great way for me to use it. Thanks for sharing your patterns & ideas. . . I'm trying to make a difference here in Africa where plastic is WAY TO POPULAR. . . I would just LOVE an Amy Butler fabric bag... a b-day prezzie to myself? Oh my! I just found you from Sew!Mama!Sew! and am I impressed!!! What a fantastic way to help the planet. Kudos! I love your site. What a wonderful idea. I'm going to make my own bags for Xmas gifts this year! This is such a fabulous blog! I'm so excited to see what a difference you have made, and it's cool that you document where the bags are being used. Kudos for helping end the dependence on plastic! I would love to have one of your fabulous bags for my trips to the market! I just found out about your website and mission through Sew, Mama, Sew and had to come check it out. I'd love to win a bag! What a fantastic idea! We always use canvas totes that I get at thrift stores. We hate some of the slogans/logos on them, but I love that we're not consuming more plastic. I'd love a Green Bag Lady bag! callmegsp (at) yahoo (dot) com. I love your blog and have made some bags for my children (in addition to the ones I use!) to take their stuff when going out- we are thru with plastic! So impressed that you were able to make it (that rain storm was awful). That combined with a series of mishaps kept me away. Glad you had a good time. chudleyhome at comcast (dot) com. I'd love to win one of your pretty bags. I too am from Oklahoma. Thank you for doing this kindness. What a wonderful idea. I plan to make many of these as soon as the kids go back to school. 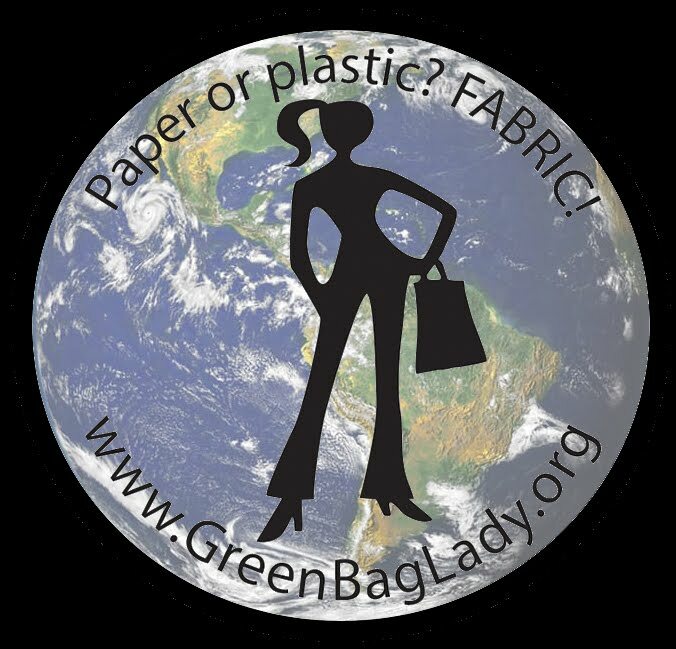 Love your green bag concept and Yea! for you for getting to see Pioneer Woman (I don't know how she does all she does, it's like she's a super hero!). I met Ree today in Tulsa. Isn't she terrific. And so pretty. I have a girl crush. I would love to win a bag!